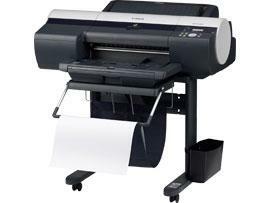 Canon imagePROGRAF IPF 5100 with CISS - Inksystem - save money on ink! Buy Plotter Canon imagePROGRAF IPF 5100 with CISS and make 30 times more quality prints for the same money! Pay only 0.04 USD for A-4 full color print! Standard Paper 80gsm, Standard Paper 90gsm, Matte Coated Paper 90gsm, Matt Coated Paper 140gsm, Extra Matt Coated Paper 180gsm, Opaque Paper 120gsm, Self Adhesive High Resolution Graphic Paper 140gsm, High Resolution Barrier Paper 180gsm, Glossy Photographic Paper 190gsm, Satin Photographic Paper 190gsm, Instant Dry Paper Glossy 200gsm, Instant Dry Paper Satin 200gsm, Glossy Photographic Paper 240gsm, Satin Photographic Paper 240gsm , Photo Paper High Glossy 255gsm, Photo Paper Semi-Matt 255gsm, Photo Paper Pearl 260gsm, Photo Realistic Paper 210gsm, Heavy Weight Glossy Photo Paper 300gsm, Heavy Weight Satin Photo Paper 300gsm, Commercial Proofing Paper 200gsm, Commercial RC Proofing Paper 210gsm, Commercial RC Proofing Paper 270gsm, Glossy Proofing Paper 195gsm, Semi Glossy Proofing Paper 195gsm, Semi Glossy Proofing Paper 255gsm, Art Paper Extra Smooth 250gsm, Prem Art Paper Embossed 225gsm, Prem Art Paper Smooth 225gsm, Water Resistant Art Canvas. Cut sheet - ISO: A4, A3, A3+, A2, B4, B3, B2, DIN: C4, C3, C2, JIS: B4, B3, B2, ANSI: 8.5 x 11", 8.5 x 14", 11 x 17", 13 x 19", 17 x 22" ARCH: 9 x 12", 12 x 18", 18? x 24? Photo:14 x 17", 12 x 16", 10 x 12", 10 x 15", 8 x 10", 16 x 20" (US Photo size), Poster:20? x 30?, 200 x 900mm, Others: 13 x 22"
257 mm (JIS B4), 329mm (JIS A3+), 420 mm (ISO A2), 431.8 mm (ISO A2+/17? ), B2 (515mm), A1 (594mm) 10", 14", 16"